Sorry! I do not know what has happened with the background color, I cannot fix it, and it is late. I'll try to correct it tomorrow. I should hope bloggers will continue to expose the fraud, lies, and misrepresentations that Chavez presents every day. The outpouring of propaganda and vote-buying is at dizzying heights. No poll in Venezuela can possibly be accurate. 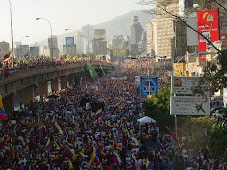 Look at the photos (evidence) of the turnouts for Capriles in Chavista zones like Barcelona. Don't fall for the manipulations of the G2. Let's not be carried away. Chavez has lost the street but that the opposition is bigger there does not mean it has the votes. There is also the motivation factor. Chavistas are more willing to stand in line at Mercal or Bien Equipada than go to a march unless they are paid and beer is free. The turnouts for Capriels are excellent this early in the campaign, but it is not enough. So you're basically agreeing with me, aren't you Daniel? Bailoterapia multitudinaria no gana eleccion contra el petrocaudillo y su ministerio de elecciones. I am glad we're on the same page. I have never disagreed with you on that respect. Maybe on what should actually done, when, how strongly, etc... but elections are never given on a silver platter. Recall that in the last Congressional election, the opposition received 52 percent of the votes. This should be a starting point for any discussion about the upcoming presidential election. At least 52 percent of people who actually voted, voted for opposition candidates. This should carry over to this years election. Chavez reached a maximum long ago. Also consider the unusually large number of undecided voters; if they were pro-Chavez then they would have no fear of saying so. Results do not always carry because there is also the question of the personalities running. Chavismo is particularly sensible to abstention when Chavez is not himself on the ticket. See 2007, 2008 and 2010. But when Chavez is on the ticket things change, see 2006 and 2009. Same thing in other countries. In France Sarkozy had an honorable defeat but his coalition went train wreck one week later. this is the curse of presidential systems where many people cannot be bothered to vote when the big honcho is not at stake. Good observation Daniel. There is still a chance Chavez won't be on the ticket but the opposition should plan on him being there. Daniel, while I respect your history of predictions on the past elections, I don't really like the accusation of "being carried away". What I'm seeing here and around the country is people not being afraid to come out & support Capriles. How can this not translate into votes. For example today he's supposed to be in Yaracuy. Let's see how many turn out for him in your own sate where you admit that the opposition does not have much chance. The reasons why polls are no longer valid in Venezuela have been widely discussed here & in the other forums. We can not give up hope. Another 6 years of Chavismo will bring us nothing but disaster. He must go. The signs are in place that this is going to happen. Be assured that I am not giving up. But once burned, twice shy. I have read Toro's piece and I do not agree on many things. Comparing 2004 and 2012 is a gross mistake if you ask me. True, the misiones effect exists then as now, but in 2004 the inflation was not 35%, the crime was half of what it is today and there were still jobs to find around, state of private. But Toro has no experience of the day to day whereas people like Island above do. Satisfaction with misiones is certainly compensated in part with dissatisfaction with so many other factors. It is to early to weight once against the other, the more so that the blackmailing system on public workers and misiones recipient is stronger than ever. That is why I think that Chavez is somewhat "ahead" but that I reserve myself until August to really start studying the siutation. Sensationalism and provocation are not my strong suit, "drama queen" I ain't not. I feel the same way, Faust. That is, I fear the deep-seated, very hungry interests that want to find every which way to manipulate the outcome of the voting process. Thank you, Daniel, for your balance and perspective. I hope you soon fix that highlighted background of your text. Just published photos of Capriles en Tucacas, Estado Falcon today. Thousands & thousands of "voters"
OT: Daniel......I have a bad feeling about this new mission Toda Vidal. I see now that the interior minister and Rangel silva are talking about deploying 10000 troops into the streets and other measures. This is perfect for them..... They can say that they are trying to fight crime......but it gives them the perfect cover to militarize the streets. What are your thoughts? My feeling is that this new program to is an excuse to buy anti riot gear for October 8. There's no stopping us now. We're on the move and we ain't dancin'. As you said Daniel, 2004 is a long time ago, in a galaxy far, far away. There is not enough anti-riot gear in Russia to stop this hurricane. Mark my words. Chavismo tries as always to create a sense of total inevitability about Chavez's reelection, knowing that polls in Venezuela cannot really be relied upon.It makes no sense to give into this, like some opposition bloggers do. It is impossible to measure the amount of Venezuelans( including Chavistas)who put up a front of supporting the government in order to avoid penalties but who are secretly waiting for the day they can cast their vote against Chavez in hope of getting rid of him. In Venezuela there has always been a reluctance to declare yourself openly against the powerful or those in charge.This was even so, even before Chavismo.Even more so is this a factor with a powerful repressive government like we have now. Because of the stealing of the votes present in elections now a days it has become practically impossible to determine the real support for the government.. This strategy of an image of inevitability could backfire on Chavez if Chavistas fail to turn out on election day because they feel Chavez cannot lose. Capriles assures that he will win by 10% over Chavez in October. I agree - 60% - 40% will be the number if the polling stations have witnesses to guard the vote. It's always good to get specifics from those close to the action. Thanks for that link, IC. I'm not so sure about the 60-40 split. As the tension mounts until breakpoint on 7O, I think the split will be much, much closer. And I can only hope that the (small) upside is for Capriles. As he himself stated, "la lucha es titánica". What I didn't know (but hoped for) was that he'll be visiting a city or town a day "hasta haber dado al menos tres veces la vuelta al territorio venezolano" by 7O. Impressive! Like millions of others, I've put my faith in this fellow. I think he and his team have the chops. We all know the Chavezimo trick of promoting fake polls and then making the election results fit the polls. We also know that the Ministry of Misinformation has Lomito A La Braza Brunches for the press to get their handouts. This Reuters story that you posted is one of the many one sided pieces that comes out of Caracas. While even the poorest Venezuelan knows this is crap many people around the world and in many languages read stories like this and take them at face value. The point is that stories like this violate journalist standards if not in Venezuela, at least in most of the world. Reuters standard is this http://handbook.reuters.com/index.php?title=Standards_and_Values and there are places to complain when they deviate from the standard. It should be noted that other news organizations in Caracas have done the same thing. Perhaps due to the situation it is now time to put their feet to the fire and get on a first name basis with their omsbudsman? Roger, please get in touch with danielinyaracuy@gmail.com. 3 interesting things this morning. Yesterday Capriles was in Barquisimeto, Estado Lara where he filled 19 blocks with thousands & thousands of followers. Very exciting. Remember Lara is the home of former Chavista governor Henry Falcon. The CNE announced that the candidates would only be allowed 3 minutes per day of political messages. This is a move against Capriles as Chavez will not be restricted in appearances giving away homes, fridges, etc. on national cadenas. The CNE will now review all polls before they are published & polling companies must register with the CNE. No comment necessary. I took the CNE ruling to mean 3 minutes of advertising per day, as in TV. Surely that does not extend to news coverage of political rallies from the Capriles camp. Globo has been covering all of HCR's house to house marches. It will be interesting to see how the CNE reacts to that given that he has said he will cross the country 3 times before the election. They may say nothing to allow the state media to cover every Chavez move. Or maybe they well restrict HCR & say nothing to Chavez. After all there is no legal recourse. "The CNE will now review all polls before they are published & polling companies must register with the CNE." This morning El Universal has an interview with Alfredo Keller of the polling company Keller y Asociados. "La calle mata a las encuestas como arma de propaganda"
"El resultado electoral tiende a un empate en donde hoy es imposible pronosticar el resultado" "La tendencia es a que Capriles suba y Chávez baje y no hay razones para pensar que eso se modifique". "Aquí la encuesta está siendo utilizada como un instrumento de propaganda, tal y como ocurre en muchas partes. Pero ese no tiene sentido porque nunca se ha podido comprobar que la guerra de encuestas de los resultados esperados." "Se busca crear un clima de invencibilidad del presidente Chávez para compensar la debilidad de su enfermedad." "En este momento la gente ya no cree en ninguna encuesta." "No del lado de Capriles. El tiene su encuestadora, que no soy yo, por cierto." "Por eso hacen (Chavistas) tanto ruido. Tratan de anular los efectos de ea realidad y de una campaña que no pueden neutralizar." I think Capriles has a good chance to win over less committed Chavez leaning voters.Many of these voters are basically unhappy with the performance of the government but feel a personal attraction to Chavez himself for who they think cares deeply about them, even though " those around him" have not allowed him to deliver. In a situation where Chavez might not serve out his turn, these voters will be left with " those around Chavez" in charge, with all their ineptitude and corruption.In other words they will keep what is bad about Chavismo without their beloved benefactor to help them anymore. Chavez himself has been emphasizing over the years that his minsters are to blame for all that has gone wrong with his government, while he himself has been infallible. Finally, there may be an upside of having Chavez blame his underlings for all his failures. Chavez has been saying they are a bunch of incompetents. Now, el pueblo believes him and may vote for someone else out of fear the underlings will take control. Can this logic be publicized? In the real world, if a supervisor hires incompetent workers, then the supervisor should be replaced. In Chavez world, why is it just the opposite?